Miso, made from a combination of fermented soybean paste and a grain, is available in several colors from light (mellow) to dark (robust, depending on which grain the paste is made with (usually barley or rice). It’s a great source of vitamin 12. While high in sodium, miso is also a great source of vitamin B12. It’s quite versatile as well, commonly used in sauces, soups, marinades, salad dressings and dips. Kept in an airtight container, it can be stored in the refrigerator for several months. Danielle made this for folks at US Botanic Garden March 6, and then again for Brookside Botanical Gardens March 12 2014. Preheat the oven to 425̊F. Cut the potatoes into 1-inch pieces. Whisk together the remaining ingredients until smooth. Toss the cut potatoes with just enough of the dressing to very lightly coat them, less than half of what is in the bowl. 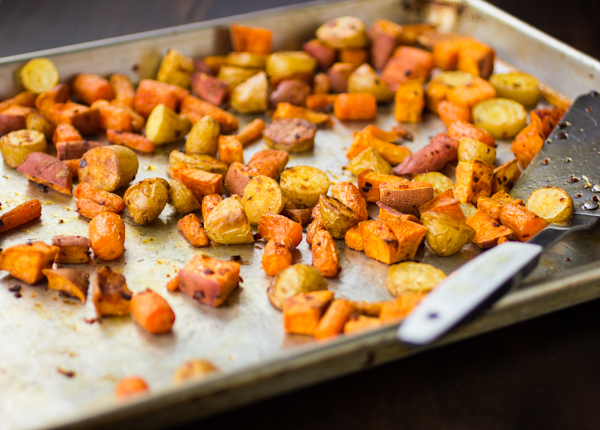 Transfer to a baking sheet and roast 30-40 minutes, until they are soft and caramelized. Just before serving, toss with remaining dressing, garnish with chopped parsley. This entry was posted in Recipes from Danielle's pantry, Sides, Vegetarian and tagged maple, miso, miso paste, soy sauce, sweet potatoes. Bookmark the permalink.